Your comments are urgently needed to help Wyoming’s wild horses today! You do not need to live in the U.S.A. to comment as we know Wyoming tourism draws people to the state from around the world to see native wild horses. Since wild horses move freely from public land to private land in the “Checkerboard” region, will they chase the native wild horses with helicopters on to private land to remove as many as possible from the entire public-private land region? They have chased them on to public land in the past to trap them. Does this roundup have a back-room connection to BP America’s Continental Divide – Creston (CD-C) natural gas project that will frack 8,950 new gas wells? The massive CD-C project already has 4,400 existing oil and gas wells. Watch GASLAND Part II on HBO July 8th to see the answer to that question. Comments are due to BLM Wyoming by 4:30 p.m. Central Time, June 10, 2013. Email your comments to Jay D’Ewart, Wild Horse and Burro Specialist, using this email address: AdobeTown_SaltWells_HMA_WY@blm.gov with “ATSW Public Comment” in the subject line. Damaged and trampled plants, terrain and destruction of the fragile ecosystem from chasing wild horses with helicopters and the potential for a stampede. Damaged and trampled plants, terrain and destruction of the fragile ecosystem from trucks and trailers as well as equipment trucks driving in and out. Damage to riparian areas from chasing wild horses with helicopters and the potential for a stampede. Damage to riparian areas and the surrounding fragile ecosystem from trucks and trailers as well as equipment trucks driving in and out. Noise pollution from noisy helicopters assaults all wildlife and disturbs sage grouse. Helicopters pollute the environment. They release CO2 that increases global warming and should not be allowed. Fuel emissions from trucks carrying equipment and trailers for the roundup pollute. Trucks release CO2 that increases global warming and should not be allowed. Dust from chasing wild horses, coupled with the stress, causes upper respiratory infections, possible permanent damage or possible death of native wild horses as well A hurting other animals in the ecosystem. Dust from equipment trucks and trucks hauling captured wild horses in trailers causes possible damage to other species in the ecosystem. Wild horses are a return-native species (E. caballus) and should not be removed. They are an essential piece in the native ecosystem, creating diversity and helping to reverse desertification. If native wild horses are removed the ecosystem will become more out of balance as we see happening because many predators species are being removed or killed. 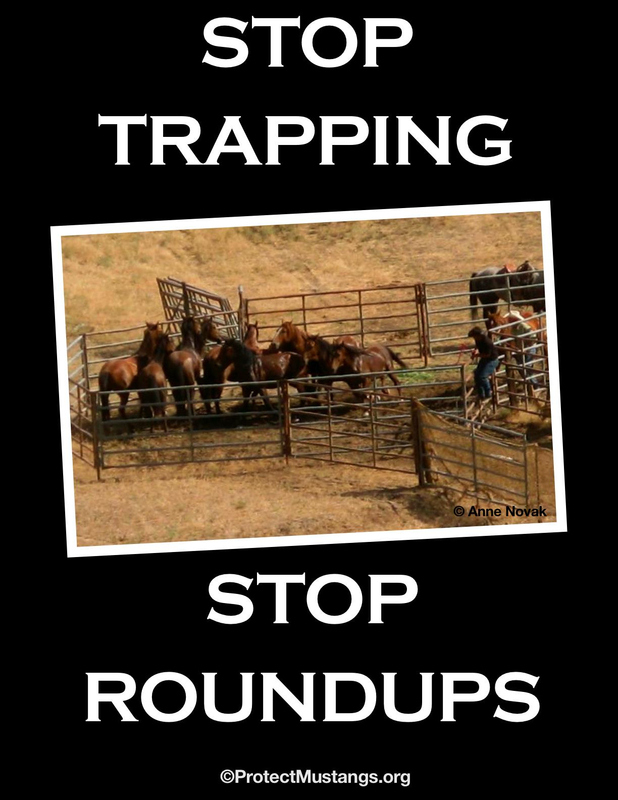 Without proving overpopulation, this proposed roundup is in violation of NEPA. Without proving overpopulation, this proposed roundup does not merit the use of risky chemical fertility control (PZP, SpayVac®) or fertility control made from pig ovaries (PZP-22, ZonaStat-H) as most pigs have become GMO animals and the risks are unknown. The “birth-control” was approved by the EPA as a “restricted use pesticide” only. Without proving overpopulation, this roundup should be cancelled. Even the NAS study said the BLM fails to provide accurate data to support their overpopulation claims. Native wild horses are not “pests” and should not be labelled or treated as if they are. They are an essential part of the native ecosystem. More items will be listed later. Your suggestions below are welcome. “The NAS findings clearly state that the BLM has failed to provide accurate estimates of the nation’s population of wild horses and burros. Therefore, the NAS cannot conclude that a state of over-population exists and or provide a recommendation for artificial management considerations such as ‘rigorous fertility controls’ to control populations for which the complex population dynamics are currently unknown.” ~Jesica Johnston, environmental scientist and biologist. The Bureau of Land Management (BLM) Rawlins and Rock Springs field offices are launching a 30-day public comment period on an environmental assessment (EA) to gather excess wild horses from the Adobe Town and Salt Wells Creek (ATSW) Herd Management Areas (HMAs).The two HMAs are managed collectively as the ATSW Complex due to wild horse movement between the two areas. The Complex is located in the checkerboard pattern of mixed public, private, and state land ownership in Sweetwater and Carbon counties, stretching from Interstate 80 south to the Wyoming/Colorado border. The BLM respects private land owner rights while managing wild horse populations. The ATSW Complex includes approximately 510,308 acres which are privately held. This gather would reduce landowner conflicts where the wild horses stray onto private lands.Population surveys conducted in May 2012 found approximately 1,005 wild horses in the ATSW Complex. However, wild horse populations are expected to increase by approximately 20 percent with the 2012 and 2013 foaling seasons, bringing the population in the ATSW Complex to an estimated 1,447 wild horses by summer.The appropriate management level (AML) for the ATSW Complex is 861-1,165 wild horses. The gather is necessary to maintain the wild horse herds toward the lower range of the established AMLs in compliance with the 1971 Wild Free-Roaming Horse and Burro Act, and the 2003 Wyoming Consent Decree. The AML for the ATSW Complex was established through an agreement with private land owners and wild horse advocacy groups. It was confirmed in the 1997 Green River Resource Management Plan (RMP) and through the 2008 Approved Rawlins RMP. The proposed gather is anticipated in 2013. The proposed action in the EA is also in conformance with the Consent Decree with the Rock Springs Grazing Association (RSGA) ordered by the U.S. District Court on April 3, 2013, to remove all wild horses from private lands within the checkerboard portion of the ATSW Complex in 2013. According to the Consent Decree, if the numbers are likely to exceed 200 wild horses within the checkerboard portion of the ATSW Complex, the BLM shall prepare to remove the wild horses from the private lands. The ATSW Complex was last gathered in fall 2010. During that gather, 99 mares released back to the HMAs were administered the PZP fertility control vaccine. Fertility control is an alternative being considered in the EA. Public comments are most helpful if they cite specific actions or impacts, and offer supporting factual information or data. Written comments should be received by June 10, and may be emailed only to AdobeTown_SaltWells_HMA_WY@blm.gov (please list “ATSW Comment” in the subject line), mailed or hand-delivered during regular business hours (7:45 a.m. to 4:30 p.m.) to: The BLM Rock Springs Field Office, ATSW Comment, 280 Highway 191 N., Rock Springs, WY 82901. Before including your address, phone number, email address, or other personal identifying information in your comment, you should be aware that your entire comment – including your personal identifying information – may be made publicly available at any time. While you may ask us in your comment to withhold your personal identifying information from public review, we cannot guarantee that we will be able to do so. For more information, please contact BLM Wild Horse Specialist Jay D’Ewart at 307-352-0256. Note to editor: A link to the EA and map of the proposed project area can be found atwww.blm.gov/wy/st/en/info/NEPA/documents/rfo/atsw-gather.html. “Give us some truth,” says Yoko Ono.